As a technology consultancy specializing in SAP, Lemongrass Consulting Ltd has moved over 1,500 SAP systems from on-premises and other cloud environments to AWS. 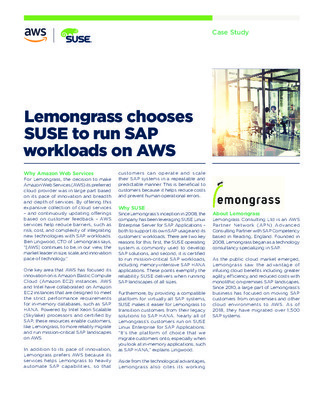 Lemongrass has used SUSE Linux Enterprise Server for SAP Applications for over 10 years to help with these moves, and nearly all of Lemongrass’s customers run on SUSE. “It’s the platform of choice that we migrate customers onto, especially when you look at in-memory applications, such as SAP HANA,” Lemongrass CTO Ben Lingwood said.